Manos Hadjidakis was born on 23 October 1925 in Xanthi, Greece. He started piano lessons at age four, later learning the violin and the accordion. In 1932 his parents divorced, and he moved with his mother to live in Athens. In 1938 his father died in a plane crash, leaving the family in a dire financial state, worsened by World War II. At this time, Hadjidakis worked several jobs to support his family, finding time to study philosophy at the University of Athens (a course he could not complete) and advanced music theory with Menelaos Pallandios. During this time Hadjidakis connected with other Greek musicians, writers and intellectuals including the revered surrealist poet Nikos Gatsos, with whom he would work on the majority of his vocal compositions. 1966 saw Hadjidakis travel to New York City for the première of Illya Darling, a Broadway musical based on Never on Sunday. His opposition to military dictatorship in Greece meant that he did not return until 1972. He soon became active in public life holding positions at the Athens State Orchestra, the National Opera, and the National Radio. In 1985 he launched his own record company Sirius and in 1989 founded and directed a small symphonic orchestra, the Orchestra of Colours. Hadjidakis died in Athens on 15 June 1994 at the age of 68. Hadjidakis’s first work was music for the song Paper Moon from Tennessee Williams’ A Streetcar Named Desire staged by Karolos Koun’s Art Theatre of Athens, a collaboration which continued for 15 years. In 1948 Hadjidakis received acclaim for a musical setting of a collection of poems by Nikos Gatsos, Blood Wedding. Hadjidakis shook the musical establishment by taking the urban folk songs that flourished in Greek cities known as rembetika, and making them respectable. In 1951 he adapted classic rembetika in his piano work, Six Folk Paintings which later became a folk ballet. His early compositions for the cinema included Stella (1955), which would prove to be one of his major successes. Hadjidakis’ most interesting compositions for the cinema were for Blue directed by Silvio Narizzano in 1968, but despite being one of his major accomplishments, is not well known. Among Hadjidakis’s major modern classical works is his 1954 song cycle for piano and baritone vocalist The C.N.S. Cycle, that recalls the German lied in its form, but not style. In 1965, his LP Gioconda’s Smile was released and almost forty years later, in 2004, it was digitally remastered and re-released. Whilst resident in the US, Hadjidakis completed major works, including the piano piece Rhythmology and the song cycle Magnus Eroticus, in which he set 12 Greek modern and ancient poems to music. He also recorded several of his most beautiful songs with the New York Rock and Roll Ensemble. 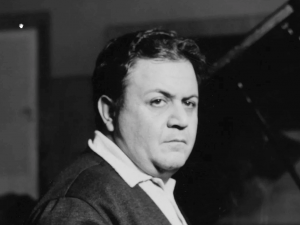 Hadjidakis is most famous for his Oscar-winning song and score for the Jules Dassin film Never on a Sunday (1960). Another popular and successful score was his composition for Rififi – Topkapi (1964). In 1959, Hadjidakis began working with the young ballad singer Nana Mouskouri. Her recording of The White Rose of Athens drew sold millions of copies. He also arranged for the song Epitaphios by Mikis Theodorakis to be recorded by Mouskouri, helping to launch Theodorakis onto the Greek public. The 60 year anniversary of their first meeting may launch another compilation album. In 1962, Hadjidakis staged the controversial, musical Street of Dreams, now a landmark in Greek theatre. He also completed revisions on one of his finest compositions, his score for Aristophanes’ Birds. Hadjidakis nominated for two Tony Awards in 1968 for Ilya, Darling as Best Musical and as Best Composer and Lyricist, with collaborator Joe Darion.